The kids are back in school, and Labor Day is almost here. All this means fall is on the way! You’d be surprised how many landscaping tasks should take place in the fall. Most people who are new to landscaping assume all the heavy lifting happens in the spring and summer. But fall is when plants start to go dormant, which opens doors to complete all sorts of vital tasks. And over the years we’ve talked about a lot of them. So we thought we’d put together this handy reference so you can have all these fall landscaping posts in one convenient place. Now’s the Time for Some Fall Fertilizing! Hey Wisconsin, It’s Mulching Season! Don’t have time to go through all these posts? Here’s your checklist. This is the time to plant any bulbs you want to see in the spring. Need to move a plant? This is the time to do it. Want to plant a tree? This is also tree planting season. If you’ve got a pool you’ve got to get it prepped for the winter season. If your lawn is unhealthy, now is the time to fix it. If it’s healthy, get it fertilized so it stays that way! Swap out your summer annuals for fall options like mums, snapdragons, or amaranth. Lay down some mulch. Be generous. The garden needs it, and so do the trees. If you’ve ever wanted to start a compost pile, now is the time. Put those fall leaves to good use. 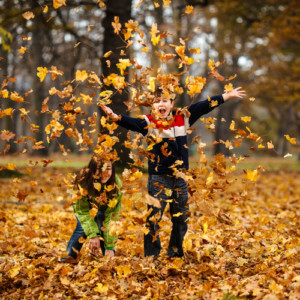 Of course, it’s also important for you to do the fall task everyone does know about: raking those leaves. You might be tempted to just leave them, thinking the snow will just cover them up anyway. Unfortunately, if you do that you’re not going to have a pretty lawn come summer. You’re going to have a big patch of dead yellow mess, because the leaves smother the grass. Of course, there’s one more task you can tackle this fall. If you’ve ever thought about adding a fence you’ve still got plenty of time. We install fences clear up until the ground freezes over. Interested? Call us for your free estimate.